Caley Thistle were short on ideas and goals as they were held to a lacklustre 0-0 Championship draw by Ayr United. Two up top failed to provide the attacking impetus for John Robertson’s side on home soil, as even with Daniel Harvie sent off and playing an hour with 10 men, Ayr rebuffed all Inverness had to throw at them. Liam Polworth’s missed penalty in the first half ultimately proved decisive and Ross Doohan had a relatively trouble-free afternoon between the posts for the Honest Men. The Caley Jags were unchanged from the 1-0 win over Falkirk for their home league opener. Ayr, making their first visit to Inverness since a 3-3 draw eight years ago, brought Mark Kerr in for Declan McDaid from the 2-0 victory over Partick Thistle. Since their last win in the Highland capital in January 2003, Ayr have spent 11 seasons in the third tier of Scottish football, with Caley Thistle in the Premiership for the majority of that period. However, a downturn in the fortunes of Inverness and a turnaround for the Honest Men since going full-time set the scene for an intriguing contest. Inverness began in a positive frame of mind, with Tom Walsh having the first chance of the game inside two minutes with a shot that did not curl enough to trouble on-loan goalkeeper Doohan. Ian McCall’s side plundered goals for fun in League 1 and have started this season in a similar vein, racking up 14 in their first five of the campaign. With the in-demand Lawrence Shankland starting up front they carried an obvious goal threat but it was Robbie Crawford who had their first opportunity, drawing a finger-tip save out of Mark Ridgers 16 minutes in. The home side’s distribution from the back was slack, with attempted passes into midfield requiring recovery tackles on several occasions. When the ball did reach the two central midfielders, Joe Chalmers and Charlie Trafford, they were reluctant to attempt passes into the final third, instead retreating or playing square balls to the flanks. When Trafford did deliver into the box, George Oakley was wrestled to the ground by Harvie, who picked up his second booking and was dismissed inside half an hour. It gave Polworth the chance to score from the spot but he sent the ball wide via the post. It flattened the mood around the stadium and Nathan Austin’s poor strike five minutes before the break did little to lift spirits. Oakley sent him racing clear behind three white shirts, leaving just Doohan to beat, but in similar fashion to his miss against Falkirk the previous week, he sent his one-on-one chance wide of goal. There was little in the way of incision from the middle of the park and Ayr remained a threat on the counter, even with 10 men. Shankland grafted a chance for himself by outmuscling Coll Donaldson but then blotted his copybook with the finish, sent well wide with Crawford waiting for a tap-in. 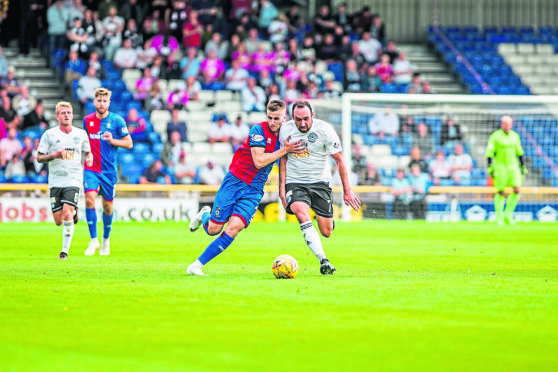 Michael Moffat rolled another past Ridgers’s post as Inverness seemed reluctant to learn their lesson, with the home fans growing more frustrated. Chalmers had an effort that went straight at Doohan and Oakley headed wide unchallenged from a Polworth corner and, while the chances were racking up for the hosts, their profligacy remained constant. Ayr were content to sit in and were good at it, bunching centrally to force Caley Jags wide and then defend the crosses. Crawford was comfortably the most exciting player on the park and forced Ridgers to beat away a drive. Even with Aaron Doran and Daniel MacKay on the park, Caley Thistle’s gameplan amounted to hoisting balls into the box from overlapping full-backs. Jordan White’s presence made that even more appealing but it was a tactic that drew no reward on a frustrating afternoon. CALEY THISTLE (4-4-2) – Ridgers 6; Rooney 6, Donaldson 6, McKay 6, Tremarco 6, Polworth 6, Trafford 6 (MacKay 68), Chalmers 6, Walsh 5 (Doran 70), Oakley 6, Austin 5 (White 59). Subs not used – Hoban, McCart, Welsh, Calder. AYR UNITED (4-4-1-1) – Doohan 6; Geggan 6, Rose 6, Adams 6, Harvie 4, Forrest 6 (Ferguson 31), Kerr 6 (Docherty 82), Murdoch 6, Crawford 7, Moffat 7 (Bell 73), Shankland 7. Subs not used – Hare-Reid, Moore, McDaid, McGuffie. Man of match: Robbie Crawford.